BBAC #21: Pain à l'Ancienne ~ I Can Do That! The slack dough uses ice-cold 40°F water and after mixing with flour, yeast, and salt, the dough is immediately stored in the refrigerator overnight. Peter explains that the delayed fermentation using ice-cold water produces a bread that "has a natural sweetness and nutlike character that is distinct from breads made from the same ingredients but fermented by the standard method, even with large percentages of pre-ferment". It has something to do with the natural sugars in flour but I won't go into details of the chemical reactions going on in this dough. The bread is delicious and it's all that matters. Some of the loaves came out nice and straight but some are crooked and uneven which I like even better because of their rustic appearance. Adding to my delight are the irregular large holes in the crumb. Once again I am grateful to Nicole for this nifty idea of becoming Peter Reinhart's virtual apprentice and being able to bake great tasting loaves of bread. This is one recipe that I will be baking over and over. I actually baked a second batch the very next day and the result is consistent in flavor and texture, light airy crispy flavorful bread. We didn't wait for the bread to cool because the loaves finished baking just in time for dinner. We spread aioli on the slices and had them with Green Bouillabaisse for a most satisfying vegetarian meal. 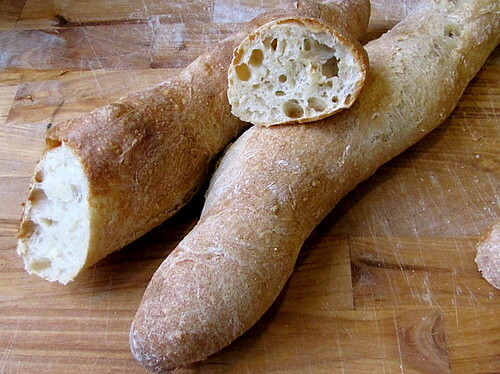 This dough can also be shaped into ciabatta or focaccia which I will be making very soon. Lovely! And I'm so jealous. 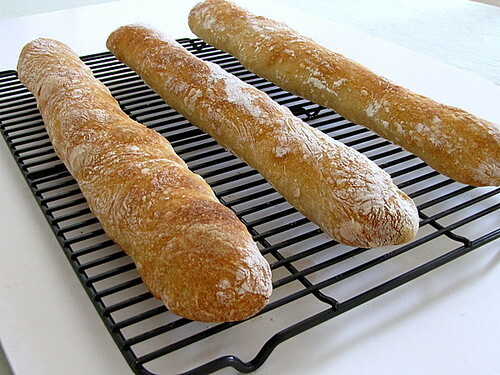 I had to end up making mine into pizza crust because it was just too wet to handle as baguettes. I will try this again though. Too bad you are not in Manila... I would buy all your bread ! Beautiful crumb and color! Your post inspires me to think that maybe I can do this one when I get to it. :wanders off mumbling, "I can do it, I can do it! ": Yum! Beautiful bread. I have to say that this is my all time favorite recipe in the book, and the one I have made about a dozen times since purchasing the book. I love this bread. Gorgeous! Wow, I hope mine turns out as nice! Okay, now I have hole envy! 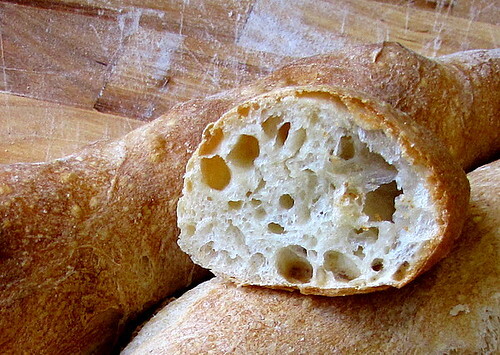 Those are some serious holes in your crumb. My dough for this bread is in the fridge right now. I am excited to bake it.